A third-generation Freemason, Merrick was initiated into Wenallt Lodge No. is married to Julie, with four children and two grandchildren between them. Mike was initiated into Harmony Lodge No. 8414 in Cardiff on 1st March 1993 and has served in that Lodge in each office, having been through the chair three times. He is currently IPZ and Principal Sojourner of Friendship and Justice Chapter No. 5830 and Junior Warden of Principality Mark Lodge No. 1057. He is also a member of the Blue Lamp Lodge No. 9840 in Chepstow, Monmouthshire. He has been honoured in the past with active roles as Provincial Grand Steward in the Craft and Provincial Grand Deputy DC in Holy Royal Arch, and is currently a Past Provincial Deputy Grand Registrar and Past Provincial Grand Sojourner, respectively. 68 years of age and living in Cardiff, Mike is a retired Police Officer and latterly a retired Higher Rights Solicitor. John is currently Senior Warden of Margam Abbey Lodge no. 5257. He is semi-retired theatre technician and sometimes still acts as MC for local theatre events. He is also a freelance VoiceOver Artist and has recorded voiceovers for various companies in the USA. Bruce was initiated into Dinas Llandaf Lodge in 2002 and became Master in 2010. He has always enjoyed the ritual side of Masonry and, having worked as a lecturer, also enjoys finding out more about the meaning and history of the order. He joined the Royal Arch through DInas Llandaf Chapter becoming First Principal in 2015. Outside of Freemasonry, Bruce works at Cardiff University helping researchers to improve society through their research. W.Bro. Robert Hughes, by his own admission, a late convert to Freemasonry, after resisting the suggestion by his blood brother for many years. His Mother Lodge is Hen Bont 4691, where he was initiated in 2009, progressing to the Chair of King Solomon in 2016. He is also a founder member of Music Lodge 9919 and a Companion of Talygarn Chapter 7216 as well as a member of Aventius College, S.R.I.A. After the usual bewildering first few steps in Freemasonry he quickly came to appreciate the value of the differing aspects of our Art, but holds a particular interest in delivering ritual and the sharing of knowledge through the Chisel Chat initiative. Rob’s higher education was three years studying hotel catering and management at the Cardiff College of Food Technology. After working in several hotels and restaurants in managerial roles he left the industry and became sole proprietor of a carpet sales and fitting company, followed by 25 yrs. as owner of a retail and wholesale bakery. Since his wife Jenny’s death in 2002 he has earned his daily bread as a singer songwriter and performer, and as an Aikido instructor. Rob has written an unusual paper detailing his observations of the shared principles and practices of the Japanese martial art of Aikido and Freemasonry. Colin was initiated into the Lodge of Endurance No. 6729 in 2007. He is the Principle Sojourner of Edgar Rutter Chapter No. 7196 and a member of Colonnade Chapter No. 7305. In 2015 Colin was integral in helping to establish the Colonnade Club , a social club for new and young masons in the Province of South Wales he served as the founding Treasurer for two years. Together with Gareth Williams he has been planning and organising the Officers’ seminars event in Treharris this Spring. Colin lives in Abercarn with his wife Camilla and their two daughters, he works in Marketing and Student Recruitment for the University of South Wales. Mark was initiated into Oeconomia Lodge No. 5457, London in February 1999, having served with the Army and finding employment in the Metropolitan Police. Mark moved to the Land of his Fathers in 2005, settling in the Swansea Valley. He became a joining member of Gnoll Lodge No. 5057 in 2006. He was Installed into the Chair of King Solomon in 2009. He has since held the position of Master of the Lodge a further two times, in 2014 & 2015. He was appointed to acting Provincial Grand Rank as PJGD in 2015. In 2001, Mark was Exhalted into Crusaders Chapter No.1677 meeting at Duke Street St. James. Following the move to Wales, he became a joining member of Gnoll Chapter No. 5057. He was Installed as First Principle of the Chapter in 2014. He is also a member of the Lord Swansea Chapter No. 8364 and the Founding Janitor of Colonnade Chapter No. 7305. He is a PPrAGSoj. Advanced into Mark Masonry in Sussex in 2003, he was Installed as Master of Earl of Courtown Lodge No. 1241 in 2012. He was Elevated in the Royal Ark Mariner degree in 2005. He became a joining member of Neath Mark Lodge and Neath RAM Lodge No. 1125. He is a member of the South Wales Installed Mark Masters Lodge No. 1201. In 2006, Mark was Installed as a Knight of the Castell Nedd Preceptory of Knights Templar in Neath, and is currently the incumbent Preceptor. He was Installed as a member of Knights Malta the following year. Mark was accepted as a Cryptic Mason into the Order of Royal & Select Masters in 2007. A member of Cartref Council No.169 which meets in Swansea, he is a Past Thrice Illustrious Master of that Council, a recipient of the Order of the Silver Trowel and the Acting District Grand Steward. Lastly and by no means least, he was Perfected into the Ancient and Accepted Rite (Rose Croix) in 2008. In that order he is a member of Groeswen Chapter No. 1036 meeting at Pontyclun. He became Sovereign of that Chapter in 2010 and is due to receive appointment to the 30° at Duke Street St. James in May 2018. He is a Founding Member of the ‘Masonic RMP’ Facebook Group which is a social and support organization for members of the Craft who are serving or who have served with the Royal Military Police. He travels all over the UK to support those members. 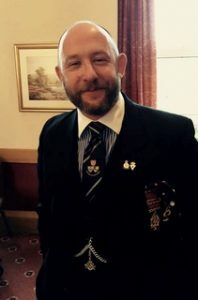 He is the Founder of the Gnoll Masonic Social Club (aka ‘The Goatriders’) which gives support to young and new Masons in Neath through an informal Masonic environment to talk Masonry, seek advice and to extend their charitable giving. He is also an active member of the Province’s Colonnade Club. Currently an Police Officer at Heathrow Police Station, he is due to retire from the Force in August 2018. That may leave him some more time for some more Freemasonry… who knows ? Gareth was initiated in Opthalmos Lodge No. 4633 in Great Queen Street Lodge. There he served in the majority of Offices and was installed into the Chair of King Solomon. Sadly, in 2015 Opthalmos Lodge surrendered its warrant and Gareth immediately joined Bute Lodge No. 960. In February 2018 Gareth was proud to be installed as Master of the Lodge. At the first meeting of Athenaeum Chapter No. 1491 after being raised to the sublime degree of a Master Mason, he was Exhalted where he rose to the role of Haggai. However, due to demanding work commitments Gareth resigned from the Chapter and immediately joined Sir George Elliott Chapter No.960, also in Cardiff. Gareth is also a member of Stability Mark Lodge No. 758 where he has yet to take office. Gareth spent his working life as a Police Officer in various stations in the South Wales area. On retiring from the Force in October 2013 spent a year working on a self employed basis for various local solicitors. He was then approached to work as a self employed consultant to various Police Force, including the Metropolitan Police as a training consultant covering such things as communications, custody software and firearms licensing software. Over the last couple of years he decided that working away from home was no good and so spent a number of years working as a supply teacher specialising in Mathematics and Information technology. In July 2017 he decided that it was time to finally retire. He now spends the majority of his space time attempting to improve his photography. A fourth generation mason, initiated in Harlequins Lodge in 1982 by W. Bro Rees Evans. A joining member of Oriel Lodge 9023 where he served as WM 1993; 1998; 2001 and Treasurer for 10 years. The founding Charity Steward and 3 times WM of the Lodge of Round Table No 9549. A joining member of the Hendre Lodge No 3250. Honorary Member of and Mandated Grand Officer in Penarth Lodge No 4113. Appointed Past Assistant Grand Director of Ceremonies in United Grand Lodge in 2012. Exalted in Llanfair Chapter No 7353, currently progressing 1AGSoj. Founding PrinSoj in Chapter of Round Table No 9549, First Principal 2000; Joining Member and Second Principal of Penarth Chapter No 4113; Joining Companion of Hendre Chapter No 3250; Joining Companion of the Chapter of Rectitude No 335 in the Province of Wiltshire. Honorary Member of Chapters: 6608, 8334, 8364, 8991, 9059 and 9520. Past Provincial Grand Scribe E., Past Prov GJ and Past Prov GH in the Province of South Wales. Appointed Past Grand Standard Bearer in Supreme Grand Chapter in 2008 and promoted to Past Assistant Grand Sojourner in 2017. Librarian in CMH since 2004. Regular contributor to Y Dalaith. Collecting, compiling, and composing 50 short talks for Royal Arch Masons. Now 72, a retired Fellow of the Royal Institution of Chartered Surveyors, has been married to Rosaleen for 49 wonderful years, their three children have provided them with seven grandchildren and five grand dogs, and a hamster.